We always use the very best office cleaning equipment available and thoroughly train our cleaning staff to get the best use of the materials available. We follow the best known techniques and methods of cleaning within the industry and always keep a close eye on the development of new cleaning technologies. At Wixted Cleaning Ltd we understand our 'clients’ needs, and do everything we can to meet there expectations. We will customise our office cleaning to meet your individual requirements and can even offer to provide cleaning services during and outside normal office working hours to make sure your office cleaning requirements are not only met but exceeded. 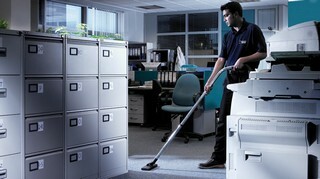 We have a vast amount of experience in office cleaning and cater for the smallest business to the largest corporation. This is a record of communication between the client and the operation manager and should be filled out two monthly. This will be discussed with the managing director on a two monthly basis. This is installed in the client’s premises as a method of effective communication between the client and Wixted Cleaning Limited. Each cleaning operative will have their own cleaning specification of all the work areas to be completed by them. Uniforms will be worn at all times. An "operation manager" of the right calibre will be responsible for the day to day management of the cleaning operation. Having a significantly low number of contracts will ensure that the location is managed on a pro-active basis. COSHH sheets will support all chemicals used. Office cleaning equipment will be checked and PAT tested on a twelve-month basis. Warren Farm, Woburn Street, Millbrook, Bedford, Bedfordshire, MK45 2HY.